Three IDF female soldiers and one male soldier, all in their early 20s, were declared dead at the scene. ZAKA Rescue and Medical Services Jerusalem Commander Bentzi Oering described the grotesque scene as reminiscent of war crimes seen in Syria or Iraq. 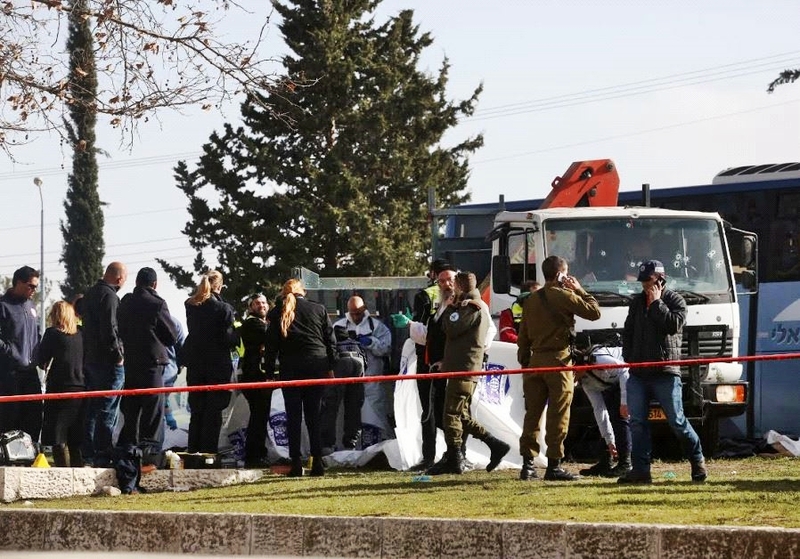 ZAKA Jerusalem Operations Commander Meir Akar said a crane from the firefighters was used to lift the front part of truck to free those trapped underneath. Jerusalem Mayor Nir Barkat spoke during an impromptu news conference to dozens of reporters. “To our dismay, there is no limit to the cruelty of the terrorists who are willing to use any means possible to murder Jews and to damage the life routine of Israel’s capital,” said Barkat.